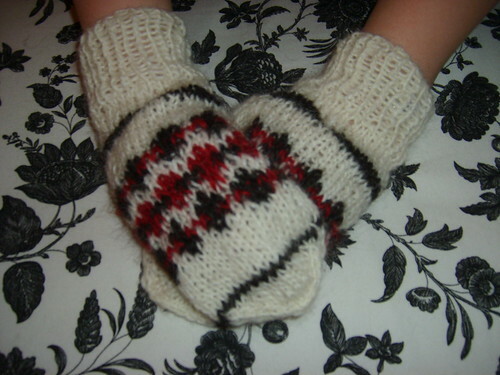 Spent yesterday afternoon and evening knitting THE mittens. I decided to fool myself so I started on the left one, clever clever! Around midnight two Lopi mittens were done and waiting to dry! In about 13 hours I will be in a bus with my students (that will soon become my former students!) on our way to Denmark. It’s their graduation trip and the last thing I will do as their teacher. I will take the mittens with me as a gift to a woman that will be my host for 3 nights. Podcasts are brilliant! You can listen to it whenever you want and it’s a great entertainment while knitting! The electric sheep is my favorite podcast! If you have iTunes you can subscribe to the podcast there, for free of course. If not you can find all the episodes here (the older ones) and here (the newer ones). You can also find the Electric sheep on Twitter! Yknit is another podcast I enjoy. It’s so alive and fresh! You can download the podcast here. Posted in knitting, life and tagged blog, FO's, mittens, podcast. Bookmark the permalink.